Leah Shaeffer is Gulfshore Playhouse’s Director of Education. She will be blogging every Thursday throughout the 2014-2015 season. By now, I’m sure you’ve all heard that the New Works Festival is over. The artists have come and (mostly) gone, hearts and minds were touched, and amazing art was made. But never fear, ladies and gentlemen, for there is a new “ovation of playwrights” in town: Gulfshore Playhouse’s new STARwrights have arrived, and they are spectacular. 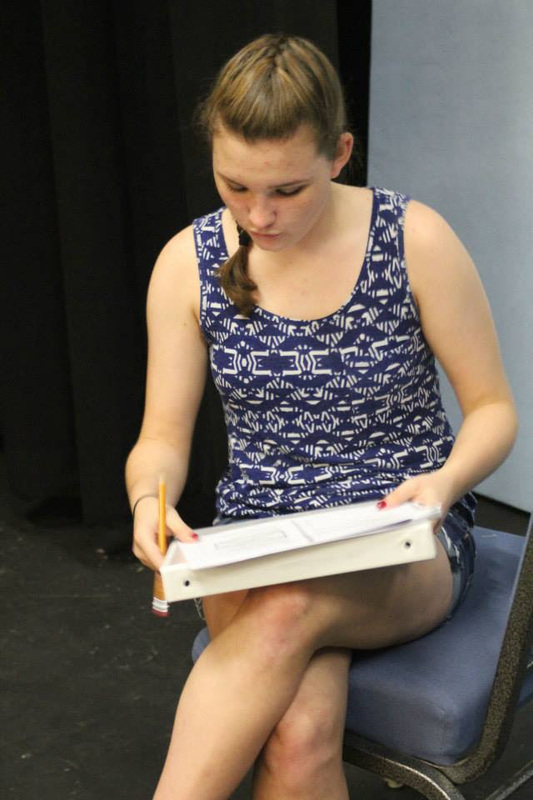 Seven of our young playwrights met for the first time last Saturday. Some are new to the Playhouse, while some are delightfully familiar faces. They range a spectrum from “almost 13” to “16 going on 17”, and hail from Bonita Springs to right around the corner here in Naples. They are a diverse bunch, but they all have three important things in common: They adore writing, they’re intensely intelligent, and they are all young women. As they all nodded their heads and murmured agreement, it was clear that they did indeed know. That’s why they had come. Luckily, we had four amazing playwrights on hand who could speak about this from experience. Our STARwrights met with the playwrights of our New Works Festival, and though some seemed star-struck at first, their eagerness to learn—and the playwrights’ eagerness to share—was thrilling to watch. The STARwrights furiously scribbled notes on the playwrights’ tidbits of wisdom and advice, such as how they overcome the dreaded “writer’s block”, and what books and resources they have used. They all smiled broadly and scribbled even more furiously upon hearing about the movement to make the voices of female playwrights heard. They made notes reminding themselves to Google the Kilroys, a group of female theatre artists in Los Angeles who are mobilizing to support female playwrights. The two female playwrights in our New Works Festival, Bianca Sams and Jenny Lane, encouraged the STARwrights in particular: “You are a part of this!” And they are. Wow. Wow, right? Just wow. I hope that the STARwrights program is a “testing ground” for these young women as well; a place where they can feel supported and empowered to let their voices be heard, and to take the risks they need to take in order to grow as artists and as people. Judging by last Saturday, I think we’ve taken a giant step in the right direction. I will see this outstanding group again in October, and I honestly can’t wait. I promise to update you all on their journeys, and who knows; maybe you’ll be lucky enough to hear their works on our stage during the 2015 New Works Festival!